Day two in Baltimore, and decide to run a different route. I head down towards the Inner Harbor as before, but once there, still proceed south to Federal Hill, which overlooks the Inner Harbor district. Hill running is a great way to get a hard work-out in the middle of a run. It’s also a great way to experience the land topology, as you actually feel the ups and downs of what you are running through. There’s a small municipal park at the top of the hill, with great views of the city. It turns out this location high up above the harbor with all the great scenery was used as a tactical military location during a difficult moment in our nation’s history, the Civil War. The first casualties of the Civil War are believed to have occurred during the Baltimore Riot of 1861 on April 19. Union troops travelling through Baltimore on their way to Washington, DC needed to transfer to a different train to complete the trip, since no direct rail route through Baltimore to Washington, DC existed at the time. Mobs of secessionists and Southern sympathizers attempted to block the troops changing trains, which escalated as the mobs started throwing large rocks and objects. Finally, panicked Union soldiers opened fire. Twelve civilians and four Union soldiers died before the Union troops made it to their destination. That night, Union troops under the cover of darkness lead by General Benjamin Butler quietly occupied the hill, and set up a cannon aimed at the heart of the city. The city of Baltimore had long been a city sympathetic to the Southern cause, and a city so close to Washington falling under Confederate control was a major Union concern. The occupation of Federal Hill was a Union success, as Baltimore remained in Union hands throughout the entire war. So the hill I ran up that morning played a small role holding this country together. 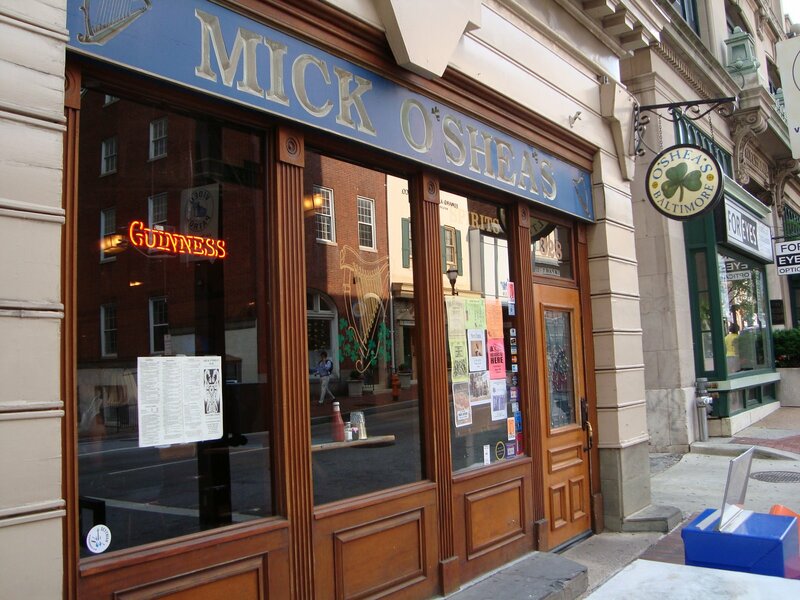 That night, I stopped in at Mick O’Shea’s, just a couple blocks from my hotel in downtown Baltimore. As you might expect from the name, it’s an Irish bar, with plenty of dark wood fixtures, Guinness signs, and brick and mortar walls. There’s a couple of TVs inside so patrons can follow the Orioles or Ravens. Trish, the bartender greets everyone walking through the door by their first name and pours their favorite drink in a single motion. I’ve never been there before, so tell her I’ll have a Yuengling lager. I order a Yuengling (pronounced “Ying Ling”) not because it is the oldest brewery in the United States, but because it is a great lager. Sometimes, I hear beer geeks talk about getting into lagers. Why did they get out of them? To me, Yuengling lager is a study in simplicity, with a crisp caramel malt and earthy hop finish. That’s it. It isn’t a beer that requires nine different fruits and spices to describe, and that’s why I like it. I had a few Yuenglings over that week at O’Shea’s. There’s really no neighborhood bar where I live, and so when on the road, I sometimes adopt one for a few days. You can easily beat O’Shea’s beer selection, but you can’t beat O’Shea’s as a place for people to get together. One night, I struck up a conversation with the person next to me and turns out, he was a Chicago Cubs fan just like me, and grew up in Holland, MI. I had actually been to Holland, MI for a collegiate cross-country race so we talked a little about the town, and what it was like for him to grow up there. One of the many great things about beer is that it brings strangers together. Mick O’Shea’s had another tasty brew on tap called Resurrection by a local brewery called The Brewer’s Art. I enjoyed this smooth Belgian style beer with a cherry-like tartness, and wondered where it came from. I ask the bartender,”I’m from out of town. Can you tell me where The Brewer’s Art is located?”, figuring it is somewhere around Baltimore, but miles away. Just eight blocks away? Looks like I need to check this place out.